Many people may wonder if it is worth growing carrots when they are so cheap to buy. The answer must be an emphatic “yes”. Fresh carrots, whether old or young, that are taken straight from the ground before being cooked taste infinitely better than shop-bought ones; there is no comparison. You may have to put up with them being covered in mud and perhaps with slug and carrot fly holes in them, but this is a minor consideration compared with the superior taste. Wild carrots appear throughout Europe and well into Asia. The exact origin of domestic carrots is rather obscure, but they probably originated in the countries of the eastern Mediterranean, possibly even in Afghanistan. The original domesticated ones were various colours, including white, yellow, purple and red, and carrots of these colours are currently being re-bred and will soon be re-introduced by seed merchants. The orange ones, with which we are all familiar, were developed in Holland and France at a much later date. The edible part of the carrot is below ground, while above are the attractive filigree leaves. Although mainly grown for the kitchen, they are well worth growing as purely decorative plants. Although carrots bought in supermarkets are more or less identical, there is a lot of variety available to the gardener. Not only are there early carrots (often grown in frames) that are round, looking almost like radishes, there are some that are long and tapered. Others are just as long but are cylindrical, with parallel sides and a rounded end. Shorter varieties are best for immediate use, while the longer ones are better for storing over winter. Although the other colours are being bred, the majority of carrots are the familiar orange, but there are a few pale yellow and creamy-white forms available. Choose an open, sunny position. 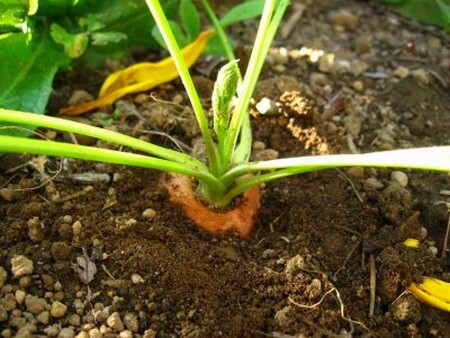 Carrots will grow in heavier soils, but they do best in light ground – sandy soils are perfect. The soil should be free from stones and fresh manure because both will cause the carrots to fork. If the soil is stony, make individual holes with a crowbar, fill them with compost (soil mix) and sow into these. Avoid freshly manured soil by using a plot that was manured for a previous crop or by manuring in the autumn. Sow very thinly in drills 1 cm deep and set 15—20cm apart. Sow under cloches in late winter or in the open from early spring, but not before the soil has warmed up to at least 7°C/45°F. Sow successionally, with the last sowing in early summer. When the seedlings appear, thin the earliest to 8cm and the maincrop to 5-8cm apart, depending on the size of carrot required. It is best to thin on a muggy, windless evening in order to avoid attracting carrot fly. For the same reason, remove all thinnings and bury them in the compost heap. Weed regularly but avoid disturbing the young carrots – a mulch of grass cuttings will help keep weeds down. It will also help to keep the soil moist. Water in dry weather. Harvesting can begin at a very early stage as the thinnings can be very delicious, although they are rather tedious to clean. Early carrots can be dug up from late spring onwards, approximately seven weeks after sowing. Maincrop carrots take a bit longer and are reach horn ten weeks onwards. Shorter varieties can be pulled, but longer ones and those that have been grown in heavier soils will need digging out with a fork. Carrots are usually left in the ground until they are required. They may even be left in the ground over winter unless there are a lot of slugs or the winter is very harsh. Instead, they can be lifted, cleaned and placed in a tray of just-moist sand or peat (peat moss). The worst pest is undoubtedly carrot fly, the maggots of which burrow into the carrots. There are an increasing number of varieties that are resistant to this pest and these may be worth trying. 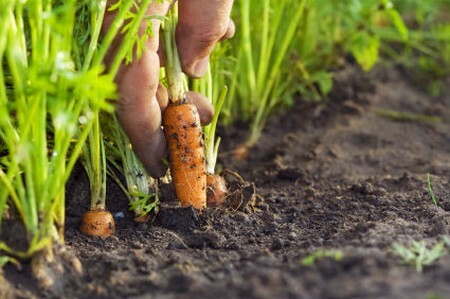 Be careful when thinning, because the flies are attracted by smell, and the bruising of any part of the carrot will release the tell-tale odor. Planting garlic nearby is a traditional way of disguising the smell. Another, cumbersome but success­ful, method is to erect a line mesh barrier, up to 90cm high, around the carrots. This deflects the flies, which lb quite close to the ground. The principal disease from which carrots are likely to stiller is violet root rot, in which, as its name suggests, the root rots, becoming a violet colour. Burn or destroy all affected plants and make sure that you do not use the same ground for carrots for at least a couple of years.